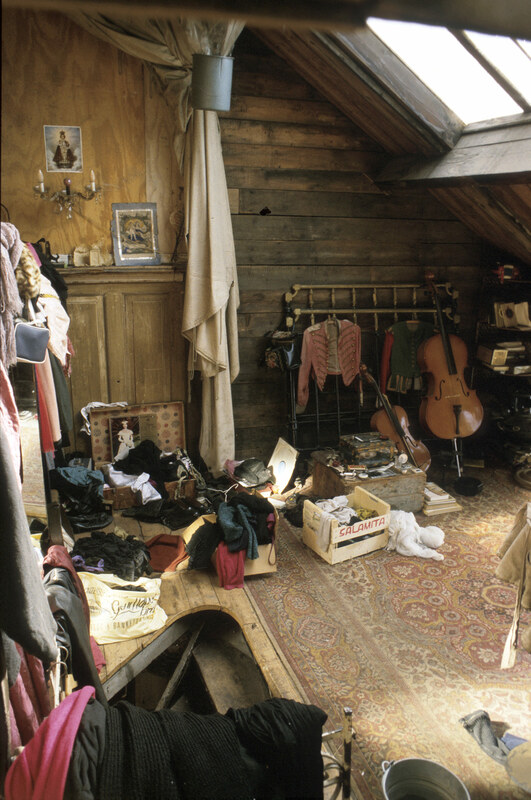 The most simple use of the shed required no differentiation of its space. A portion of this functionally undedfined shed is equally sufficient for its original use for entrepot storage as for its new use as the enclosure for large-scale fabrication work. 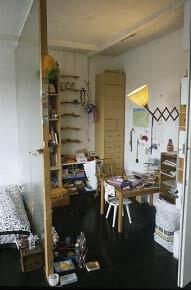 Small scale making required a relatively simple differentiation of a relatively small portion of the shed. However, with 10m painted side walls squeezing a mere 4m (1 bay) width, a domestic-scale windowed frontage filling the blank loading-door's frame, and its high volume divided by a floor, the presence of the containing shed is banished to the edges of even a simple workshop. 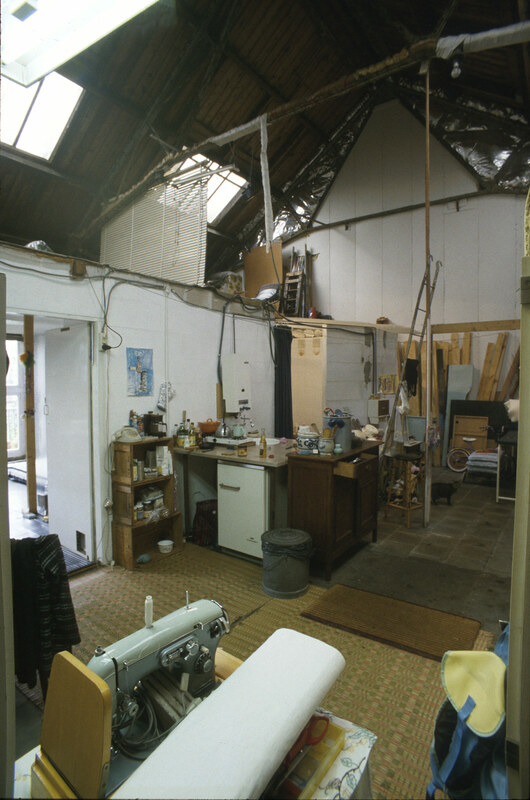 Four small work-shops/studios were made inside De Loods - two are shown here. In the empty undivided shed establishing a home required dividing off a portion, differentiating the volume within it, installing/re-routing services, providing the manifold requirements of domestic living. 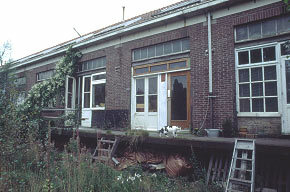 Five such homes were built inside De Loods - three are shown here - the earliest: the first home built in De Loods, is presented first. This first De Loods home is transitional between a type 1-1 workshop and a 'house' - it scatters its functional parts in a single layer over its huge site like installations on a workshop floor. 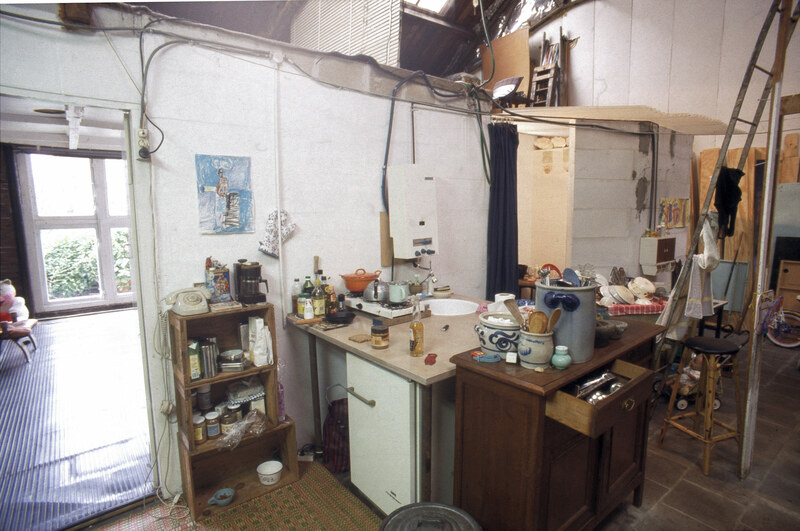 The two other homes densely fill the volume of their more restricted portions of the shed. The erstwhile Customs House is a portion of De Loods specialised for offices which required only minor adaptation for domestic use [Re: SILO - CENTRE STAIR offices]. Occupied by a single family. 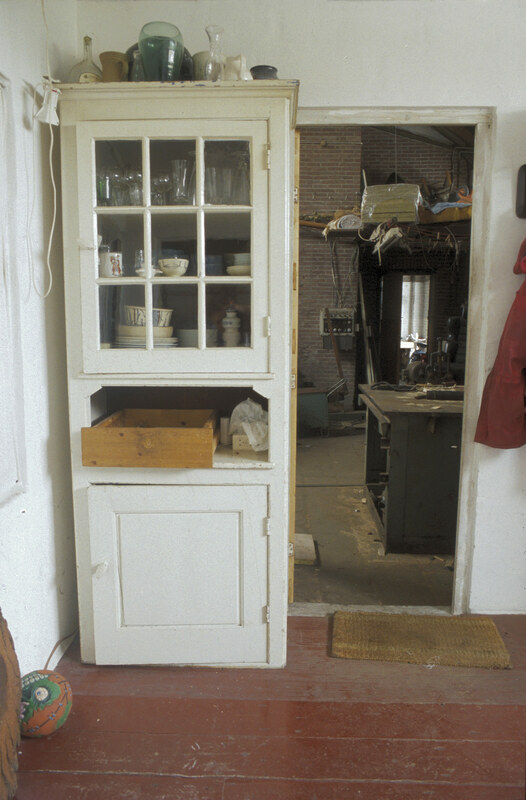 The dock-workers' house is a portion of De Loods pre-designed as homes, which thus required no adaptation to domestic use beyond personal choice of furniture and fittings. 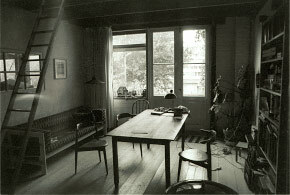 Occupied (in 1994) by eight people. 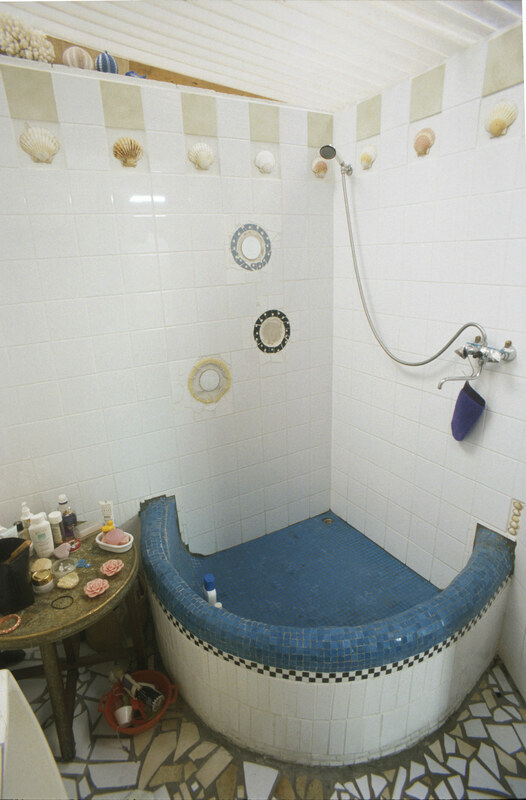 One example is shown here. 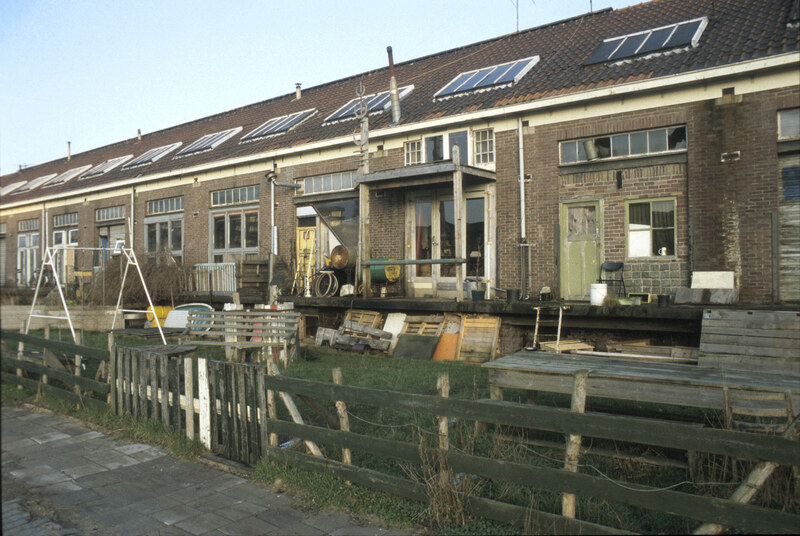 Complete little independent houses were built on the De Loods-Westerdok quay. Caravans parked on the De Loods-Westerdok quay. 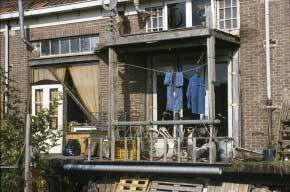 Living-boats moored against the De Loods-Westerdok quay. 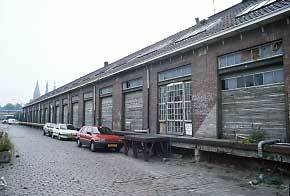 De Loods comprises x54 4m wide bays (and a north end 1960 'house' extension). Its width is 10.5m; max ht 8m; length of shed (excluding north end house) is approx 212m. 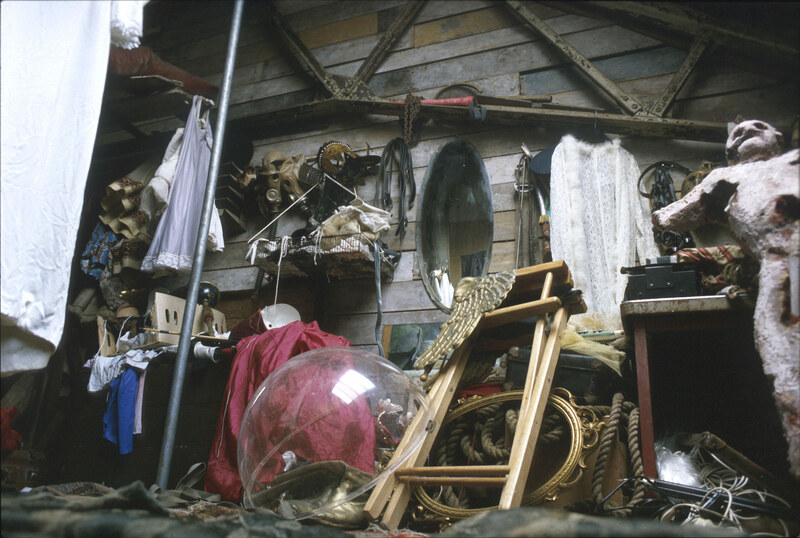 The shed as an undifferentiated enclosure. 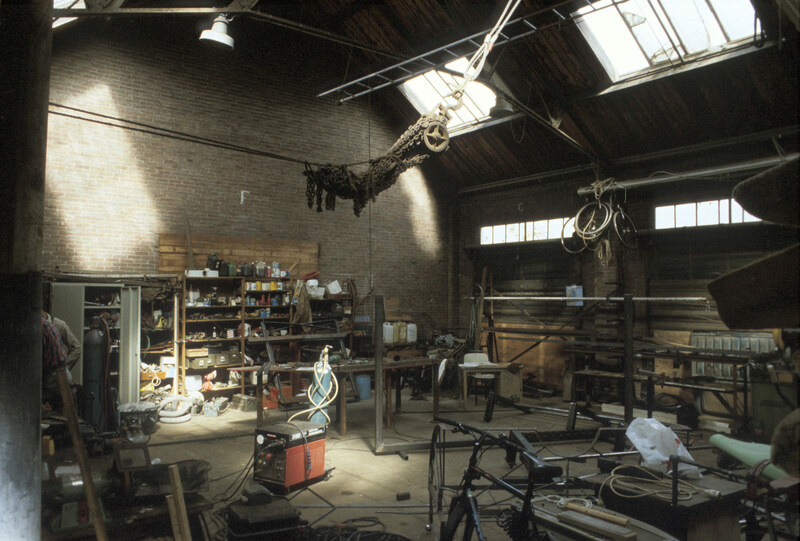 This functionally undefined shed is equally sufficient for its original use for entrepot storage as for its new use as the enclosure of a fabrication workshop. Shown here is the most pure example of Type 1. 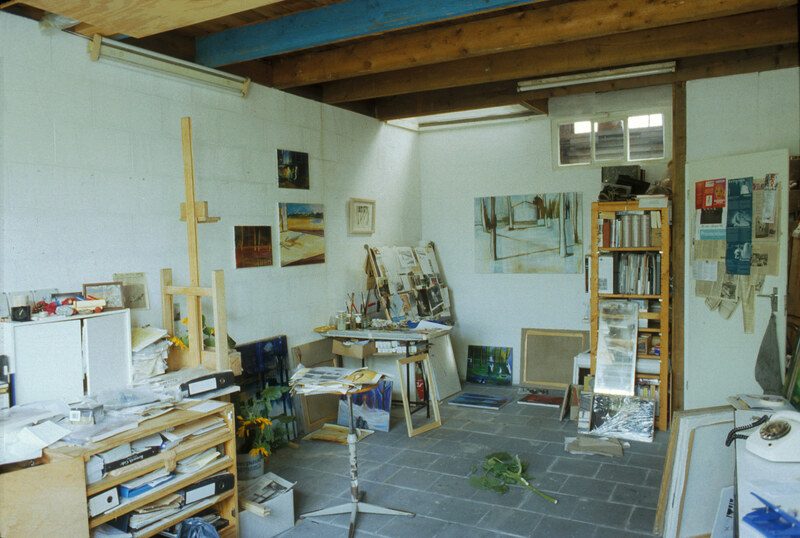 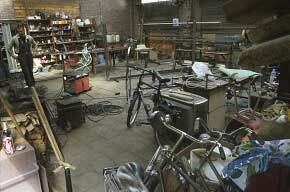 A similar workshop in a similarly undifferentiated portion of the shed (though closed at its south end by the new wall of an adjacent home) can be seen below [Re: LEEN Workshop - EELCO LEEMANS HOME]. 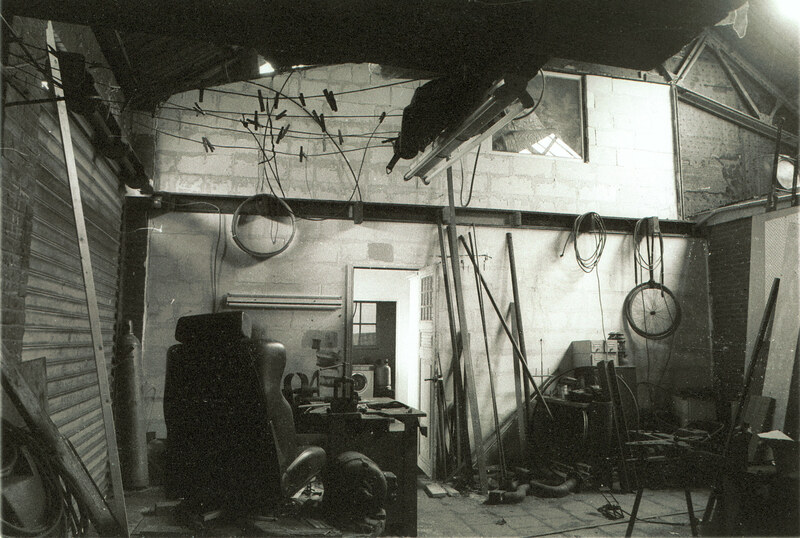 The shed in its original condition: an undifferentiated enclosed space. This final 5 bay portion north of the dock-workers' house was used entire - already separated from the rest of the shed it did not even require end-walls. 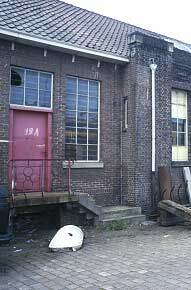 Three out of the 5 homes built inside De Loods are shown here. 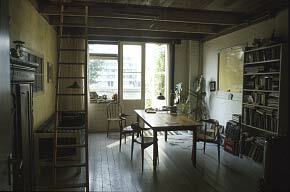 They illustrate three different ways of organizing the relation of home to location. 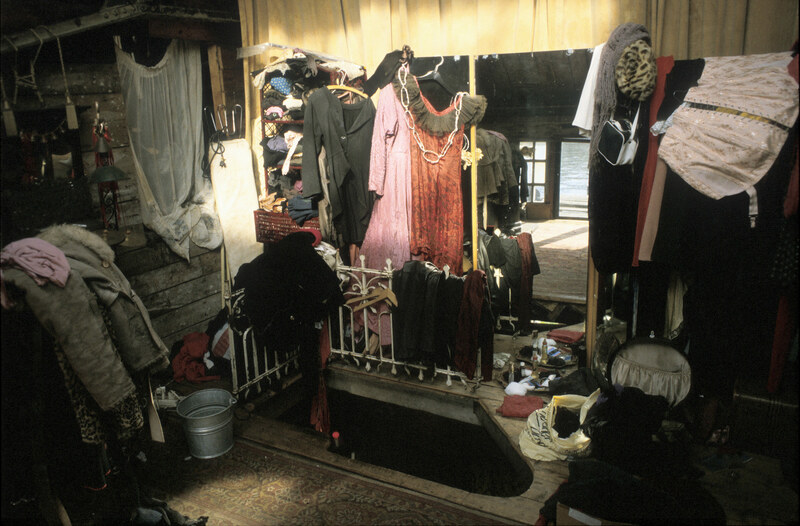 Alma’s, the earliest of the three homes, treats the shed-space as an ‘open site’ to build on - her house is a developed stage of the tented camp that was its inception. 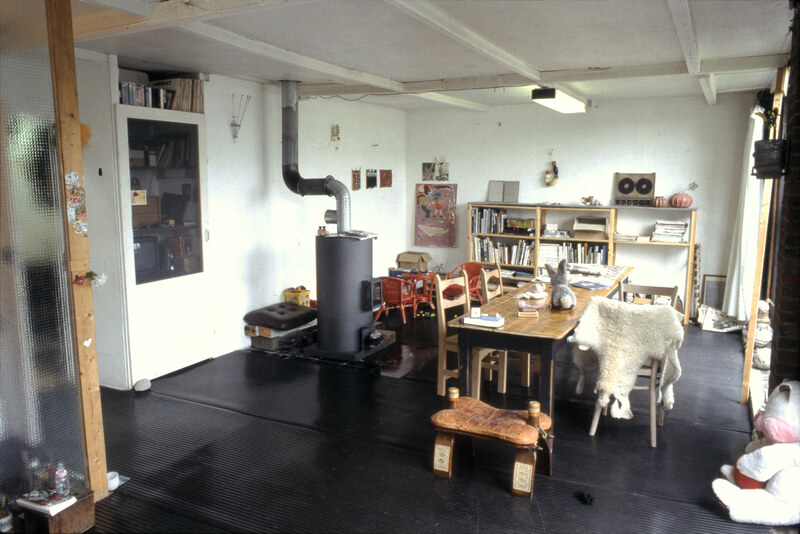 Unlike the other two examples, the ‘house-like’ part: its heated living/bed room, is not identical with a portion of the Shed itself, but is a box within the enclosure; the primary space of the shed is thus never conquered and digested as ‘home’. 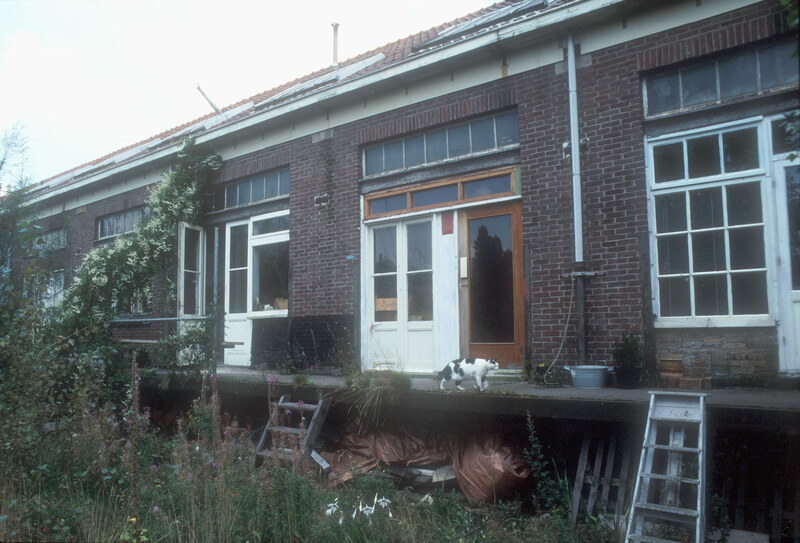 She prefers this ‘exterior’ solution, the contrast of sealed home and ‘open’ shed: (ALMA: “You couldn’t see the interesting things in De Loods under an ugly ceiling”). 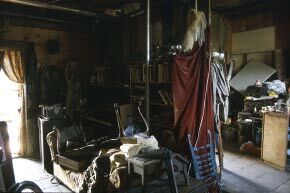 Grace’s home is the opposite of the first, filling its site to the almost total physical and mental exclusion of its origin. 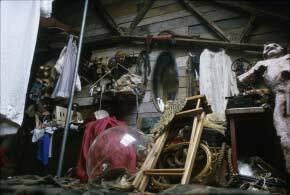 It packs a narrow 8m slice of Shed with such dense convoluted routes of such strangely linked places, so fascinatingly encrusted with objects, that one can become lost inside it and (as in a dream or story) forget its location and lose sense of size and orientation. 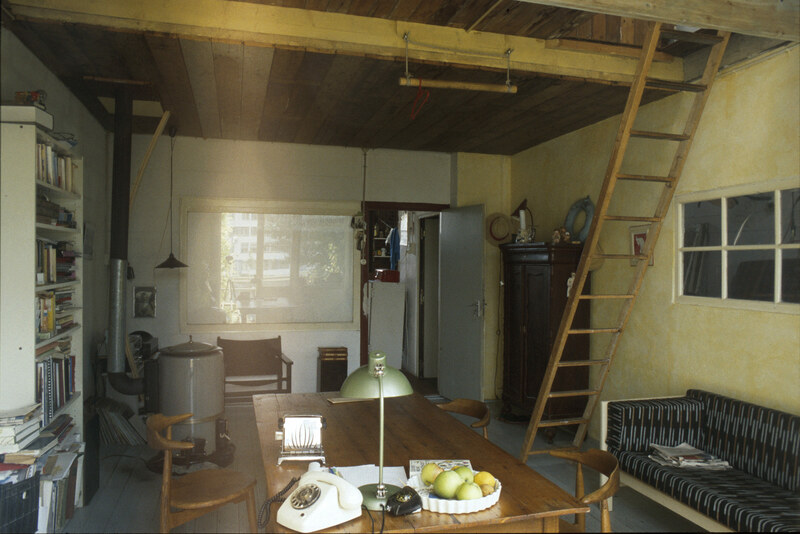 Eelco’s well-made conventional wooden house excises a rectangular 2-bay section of the shed between the usual cement-block walls - unusually however these can be seen from without, like the facades of a row-house. 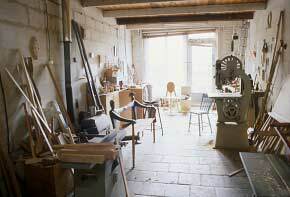 It is entered through a scavenged ‘cottage-door’ approached along a flag-stoned ‘garden-path’ wending between machines across a large fore-court of unredeemed workshop (itself entered through a steel door in De Loods’ road front). 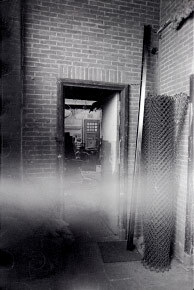 At its rear one exits through a 'back-door' into a small 'back-yard'. 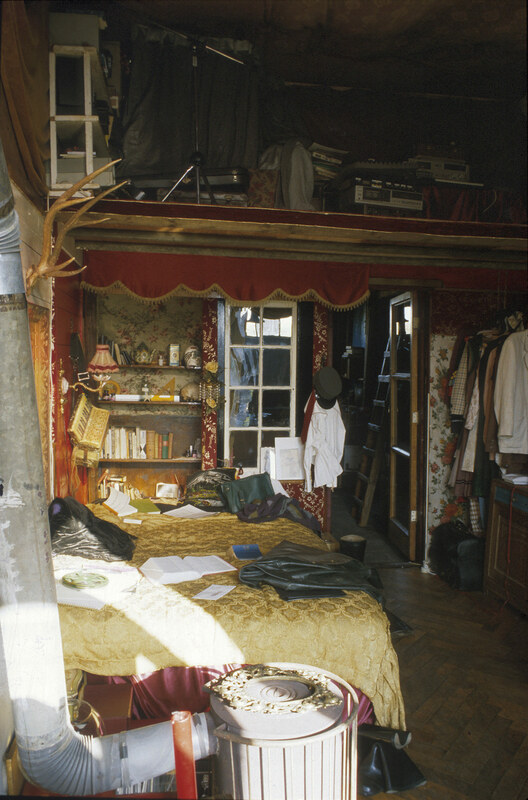 The dwelling can thus be more completely appraised as an object: a ‘house inside a shed’ (almost a ‘whole-house’ version of Alma’s living-room 'box'). 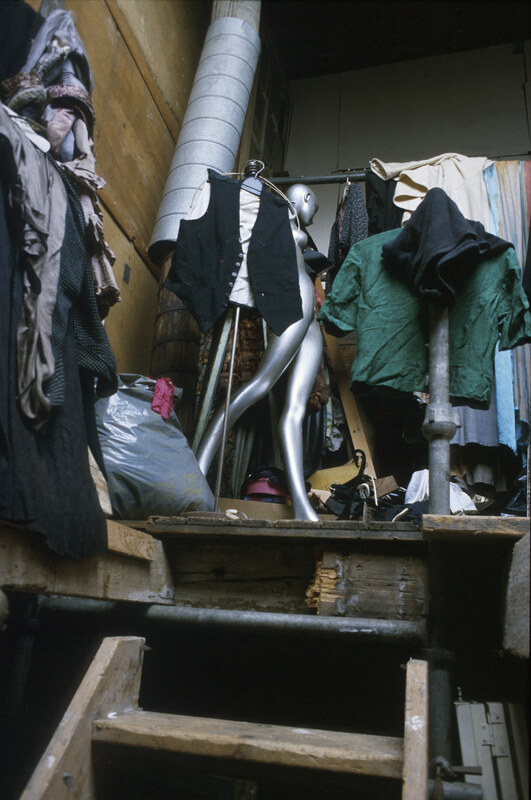 In January 1983 much of De Loods was rented to companies for store-space; there was one squatted studio-space [Paul], and several people now occupied the rail-workers house. 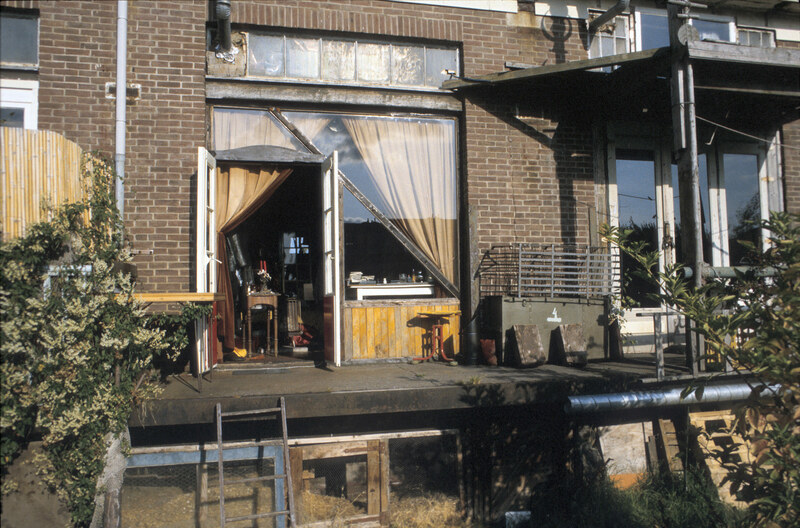 The first time De Loods was squatted with the intention of building homes in it was January ‘83 when a group of five (a single and two couples) came from a neighbourhood squat, soon to be destroyed. As it turned out only two of this group succeeded in forming a home beyond the ‘break-even point’: up to which the investment can be defeated by memories of comfort! 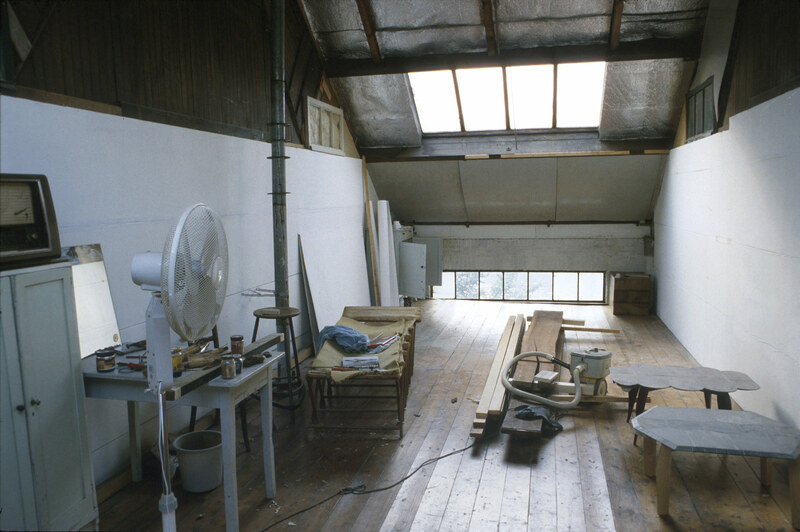 The group took a 6-bay wide space (24x10m), next to Paul’s enormous studio, divided from it by the ubiquitous polythene-curtain (of all squats’ first-stage of territory differentiation). It was very cold - they collected building materials and left (into accommodation courtesy of the neighbourhood squatting group) - returning in April to find a new squatter building with their materials, they helped him and replaced them from the skips of the Houtmann renovation (an ex-squatted warehouse on Van Diemensstaat). 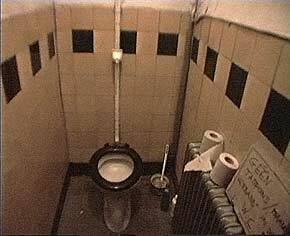 That summer the four remaining (the single man had left) camped in tents inside their space - built a WC and shower (water piped through a 40m hose from a still-functioning De Loods WC), and two cement-block walled top-less living-enclosures. 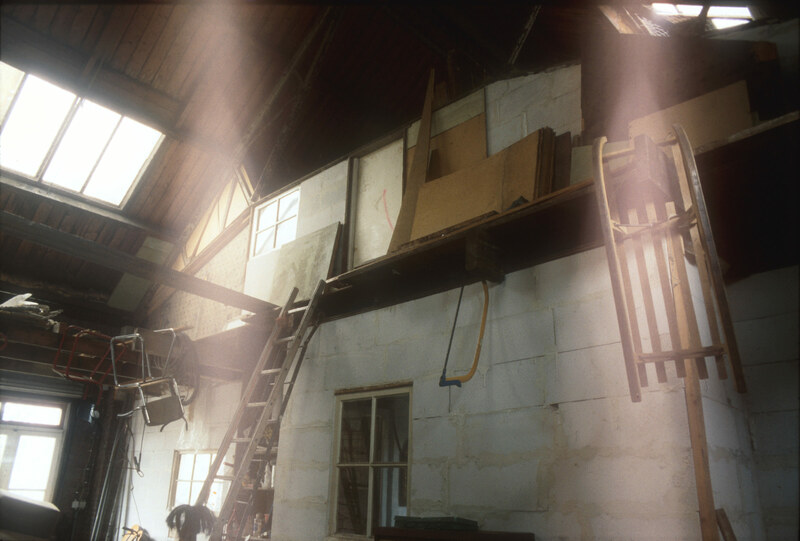 Before the winter they capped these ‘boxes’ with timber-stiffened board ceilings and installed heaters. 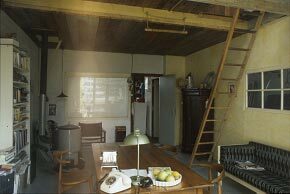 The group dispersed however: one couple left and the other separated, dividing the space and ‘living-boxes’ between them - one of these is described below. 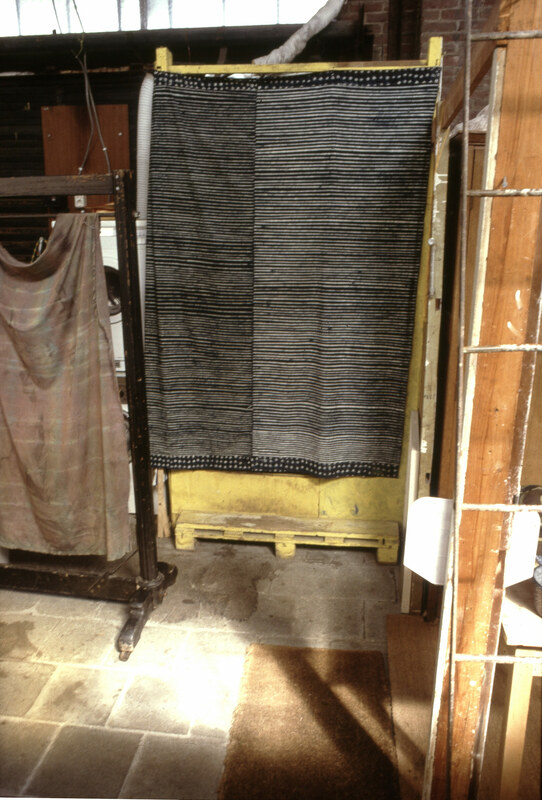 Alma has continued to differentiate her living-space around the core of its initial (8m x 4·5m x 2·4m high) box-like inner room. 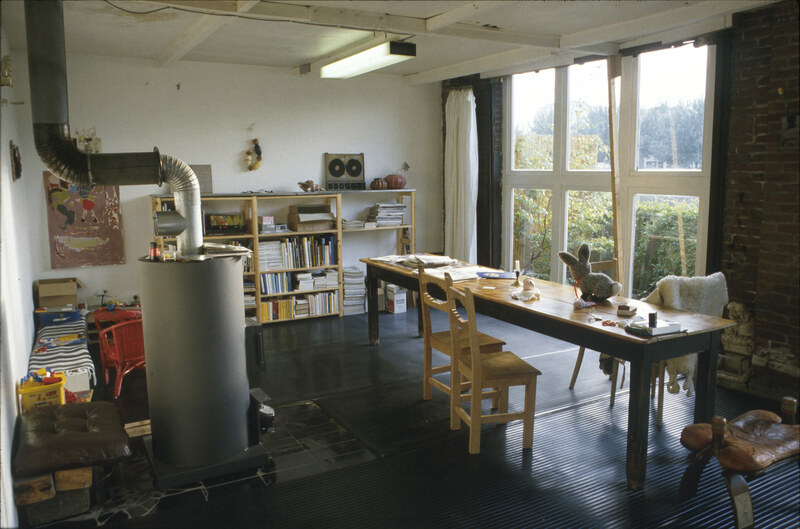 This functions as a separate warm and comfortable ‘house’ within the ‘outside’ space of the voluminous enclosure of her portion of the shed, where other domestic needs/functions are grouped along a kind of ‘street’, continuous with its entrance-passage. Lined up along the west side is a row of cupboard-like objects (hiding a store-space behind): first a curtained yellow WC raised over its drain; then kitchen-store, clothes-store, etc-stores. 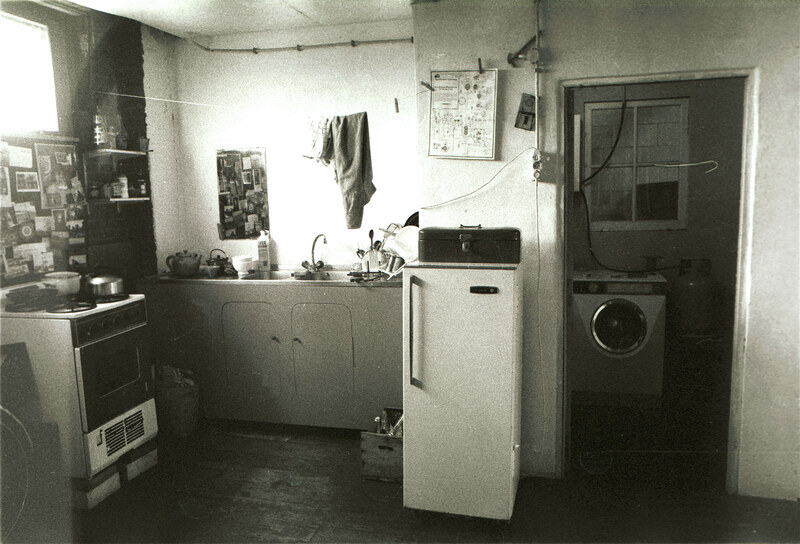 Opposite: a toy kitchen, plastic-roofed shower (with a mosaic quadrant tub), and a rudimentary kitchen with bottled-gas hob (so common in Amsterdam flats and squats). 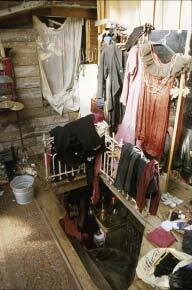 Overhead the lagged water-pipes are part of “a huge system of garden-hoses along the tops of walls and through the gardens serving many boats and seven shed-dwellers” - all originating about 60M away in the old Customs Offices [Ref: RENÉ & ANNALOOS HOME]. 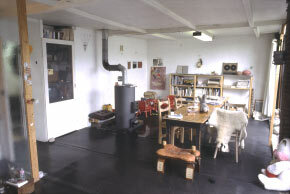 This dwelling is another example of enhancement of sensation and significance by contrast - (subdued in ‘mass-houses’ and replaced by mass-media stimulants): Entering the big enclosing windowless shed and steering for the cosy inner room is like approaching a house across its walled plot (albeit a house that has spilled some of its more physical functions outside). 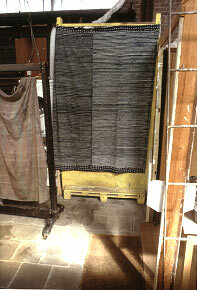 Though the big shed is ‘outside’ to the inner room, it is a ‘blind’ enclosure (more opaque than a dark night!) 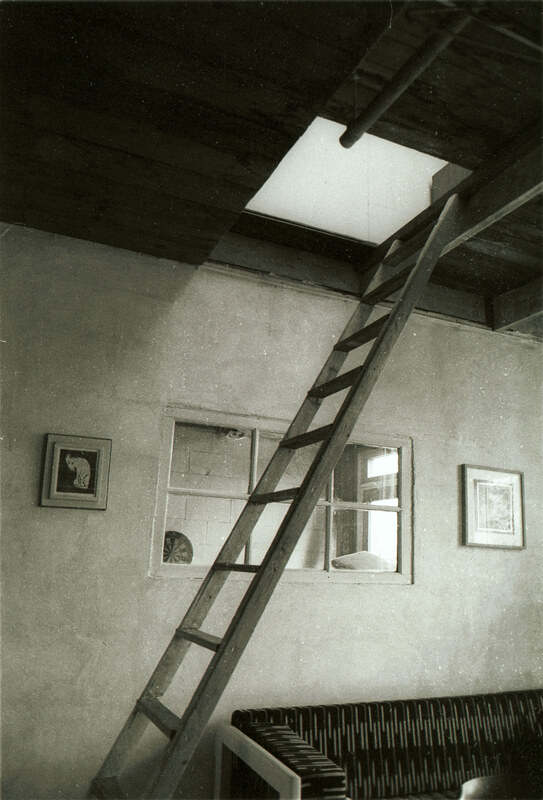 - the fact that only by going further in: into the most inward and enclosed space, can the true outside be seen, gives the inner windowed room an almost magical intensity of provision: an experiential temenos! [Ref: EELCO L HOME]. 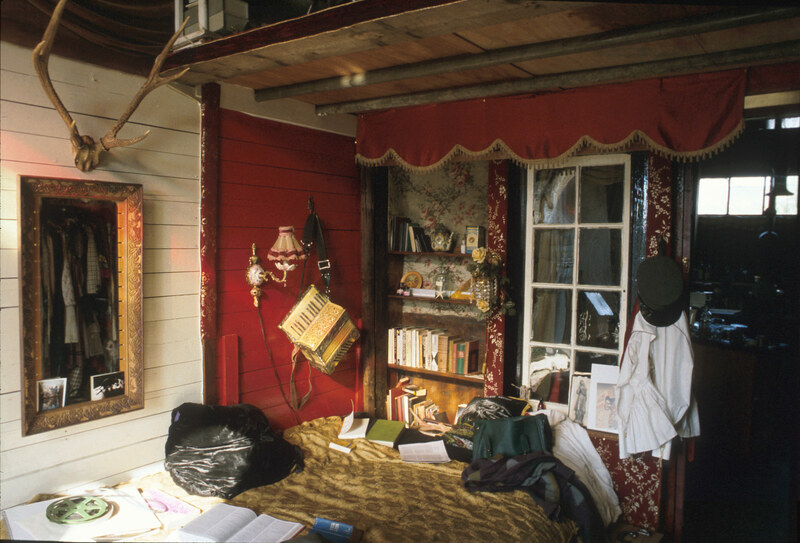 In cold weather especially, the dialectic of room/shed // outside/inside was paradoxical and funny: if from shed into room felt like ‘going indoors’ in terms of space and warmth, it yet led to contact with the real-outside...thus leaving the room again and going into the enclosure of the shed to cook and so on, evoked a sense of entering the ‘even-more inner parts of a house’, yet in fact exposed one to the stimulating rigours of camping! 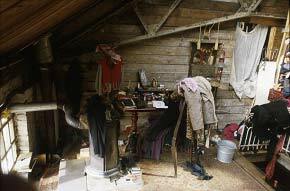 Alma: “One cooks with ones winter coat on.”. 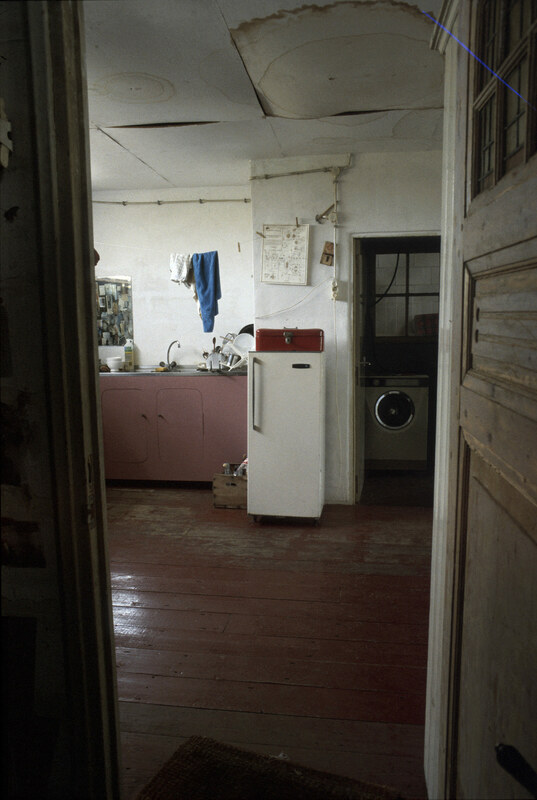 Almost the whole home (structure and fittings) is scrap, free or cheap: cement-blocks are second-hand, the inner-room’s’ ceiling is skipped wood and board (its flimsiness assisted by two wire-cables to the trusses above), its two big windows filling the loading-doors were free from a hall-of-residence re-con (they fitted exactly without cutting - a story of ‘luck’ one hears so frequently in relation to improvisation it begins to seem somehow innate in the situation or ‘mind-set’); the stove was the only new item, and “very expensive”. 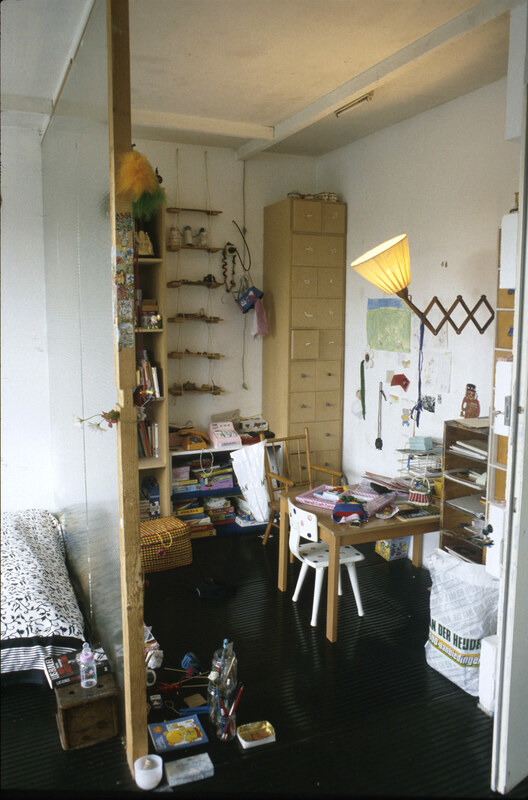 On its large 'weather-sealed-plot' the home continues to change: the big ceilinged box of the living-room has (1995) grown a smaller replica extension (for the seven year old daughter) onto the unused site ‘outside’. 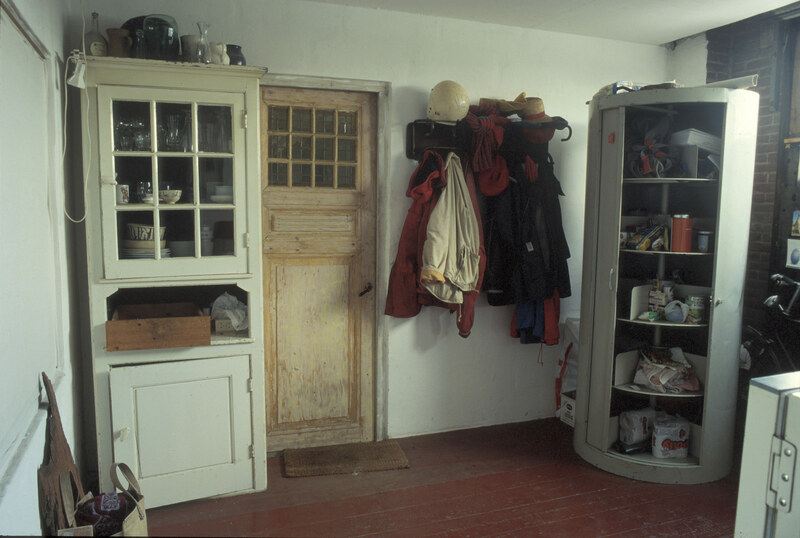 The home's entry passage from the 'front-door' is at the far end and to the left. On the left side is the big white box and open door of the heated living room. 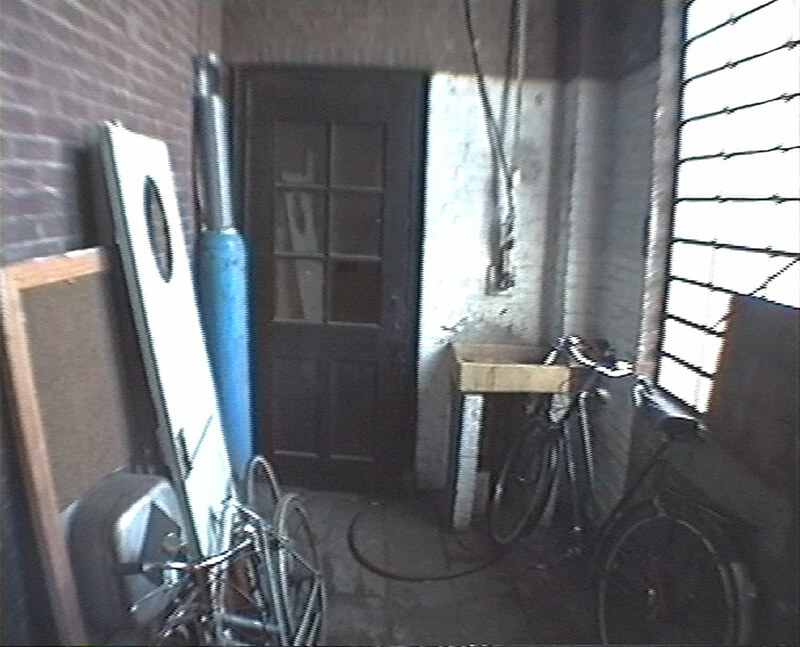 The rt wall is the 'outside' wall of the compartment - in the next pic one can see the box that powers the shower and the hoses and pipes that constitute part of the water system: a fragment of the long hose-system whose source is in Eelco/Leen's toilet [bay 33-E]. 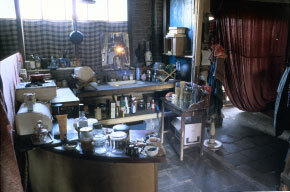 It packs its quite narrow 8m slab so densely, like an intestine - such a convoluted route of spaces, so strangely linked, so beautiful in their rich incrustation of objects, that one forgets completely it's inside a great bare shed, except as one rounds the back kitchen where the space opens and the house recedes - the coldness of the rear road washes in like a brief tide over huge worn flag-stones and the shed shows its walls. 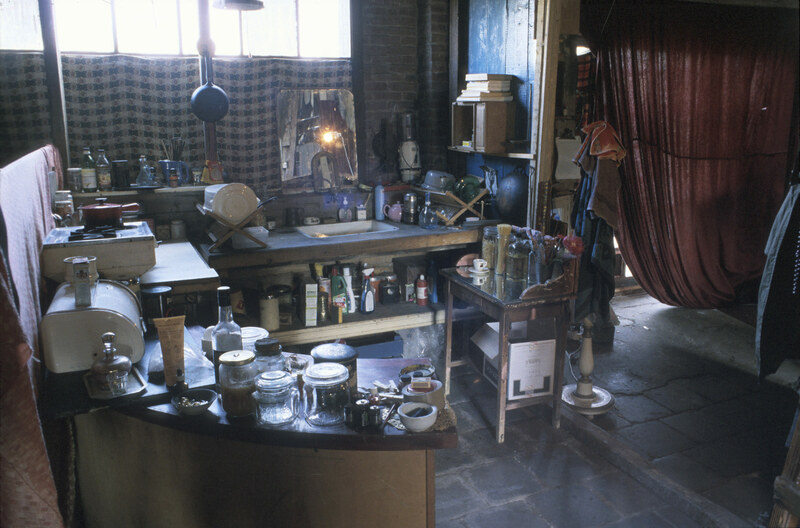 A weirdly childlike house, more like a story than a ‘real place’, but concrete, sensational, complex and rational, constructionally proficient and marvellously ‘crafted’ - using things as needed yet always so straightforwardly they invariably show the beauty of their presence: objects as industrial as De Loods itself and others of ‘luxurious uselessness’. 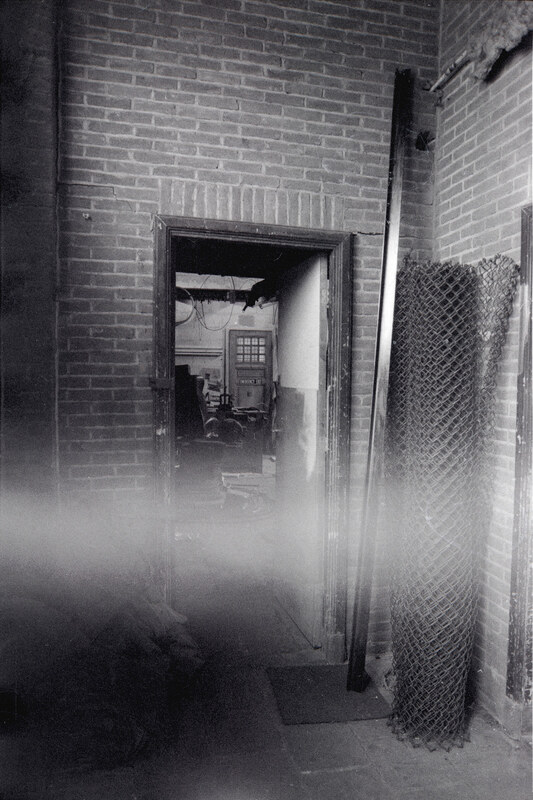 Looking back to the road's south entry from Bays 18 and 17 (Grace's home). Walking along this dismal rear of the shed, Grace's bay 17 construction of windows (found by Maria) is the first evidence of individualistic intervention. 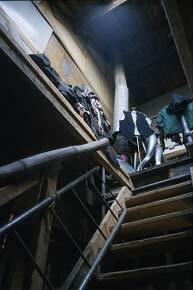 To its right, bay 18 - almost completely blocked with planks - is Grace's kitchen (its water-waste pipe protrudes from its facade). Grace's bay 17's facade-extension [see next pic] is supported on the De Loods loading platform, it provides Grace's SW front room with a veranda and her SW upper room a terrace served by a wall opening enlarged from the strip-window that heads each De Loods bay-door and filled with scrapped windows. 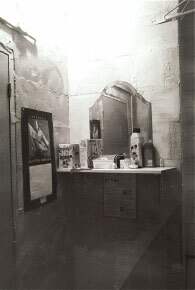 Its post-supported 'totem' is a performance prop. 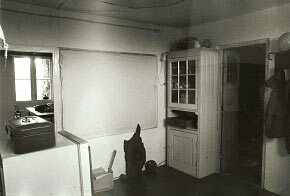 Grace's bay 17's facade-extension was made by Maria. 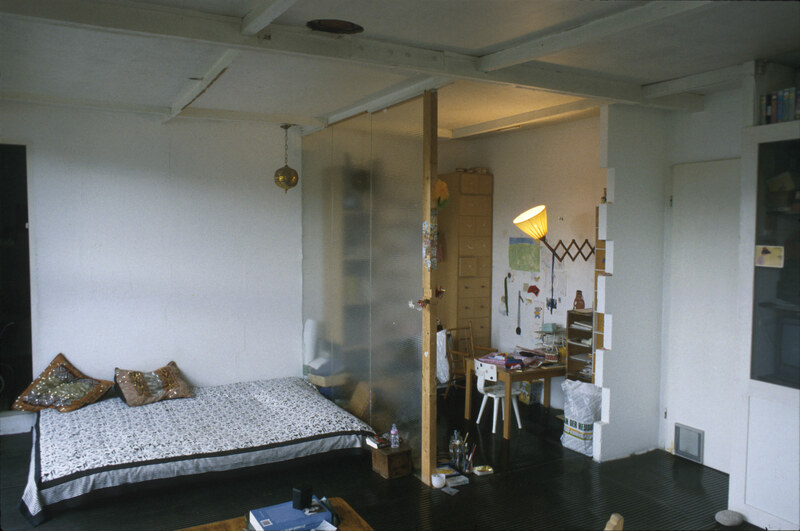 Bay 18 Djeff's room. 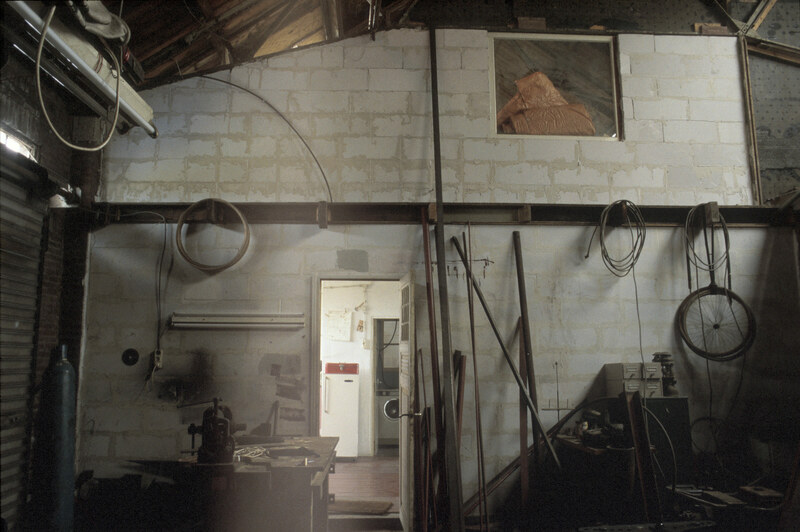 Grace made its strange window with cheap triangular offcuts from a glass company. 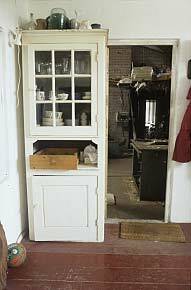 Passage from rear stair hall to front SW room; (this runs parallel to another short passage from the kitchen to the front NW room (Djeff's)). 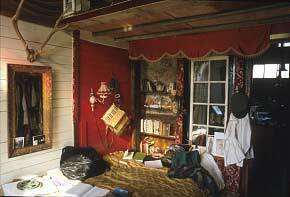 The red curtain was a Russian gift. 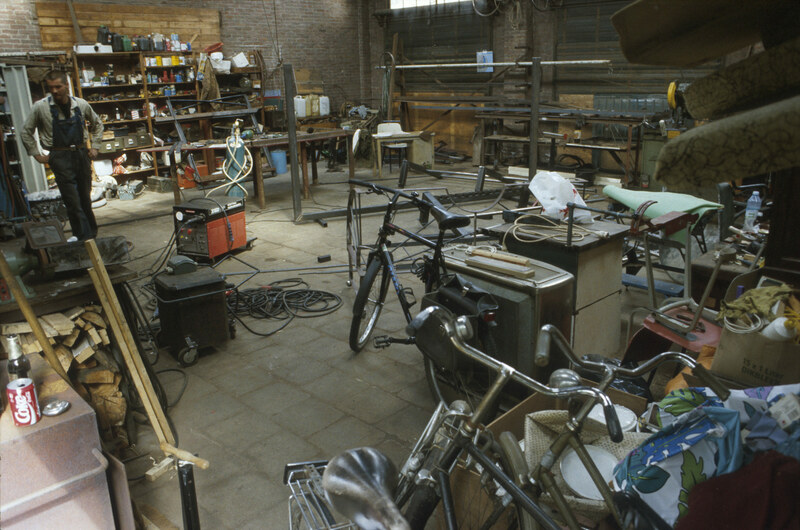 Before the house was enclosed the performance group 'Zyklus' made props in de Loods. 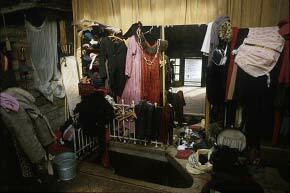 Upper W-front store space for Grace's shop clothes. 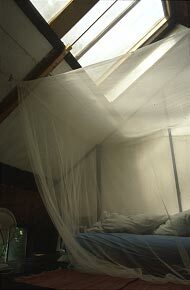 Polythene guides water from the leaky skylight to a pipe through the front facade. 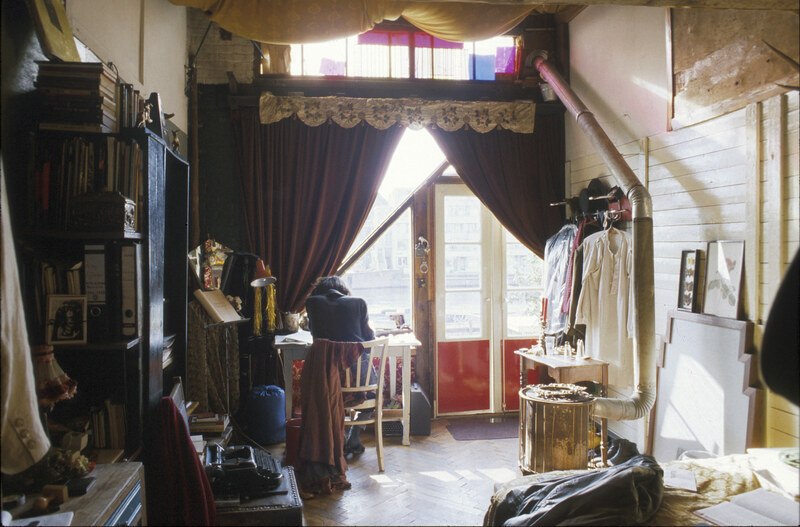 Upper front store space with curtained entry to SW room. 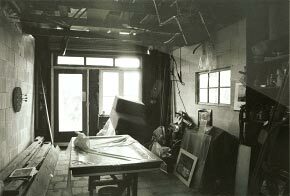 Upper front SW room - view down from the store-space entry. 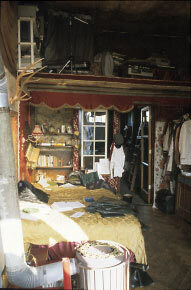 Upper front SW room with curtained entry from front store-space a metre up the wall [pic: rt]. 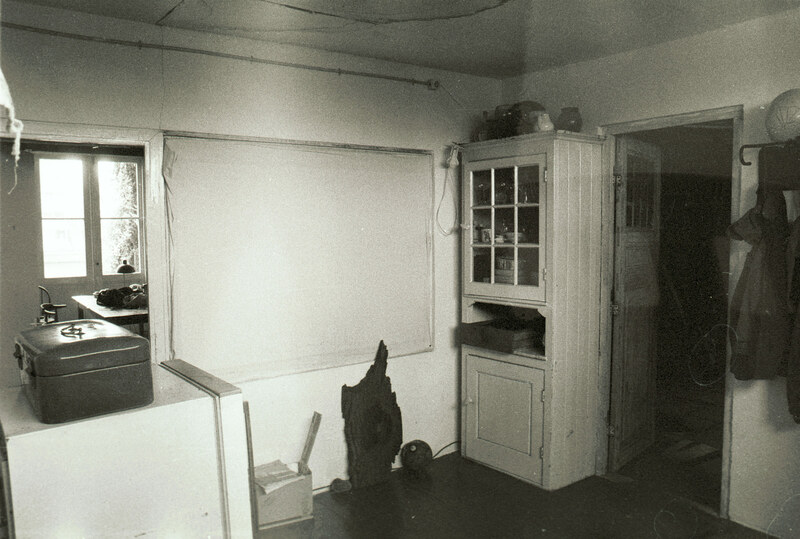 This upper front SW room is windowed with ######, Here at floor level - a mirror, like a hole in the facing wall, reflects Westerdok's waves. 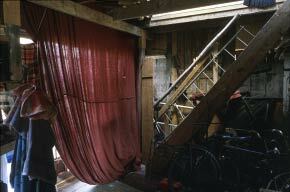 Upper front (SW) room with curtained entry from front store-space and floor-hole stair to the front lower room. 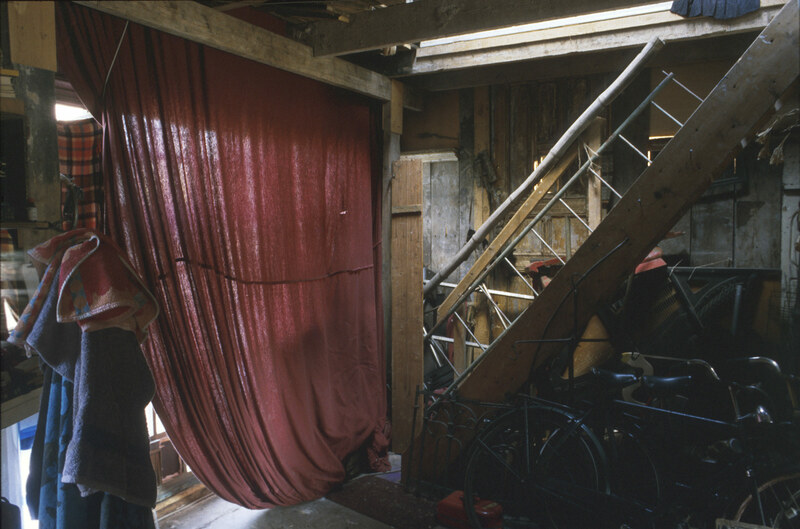 Lower front (SW) room with stair from the upper front room and passage to rear stair and kitchen. 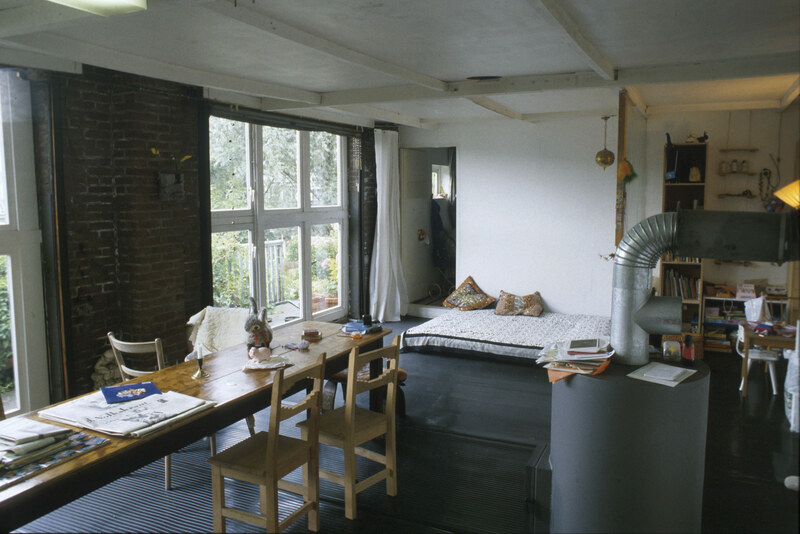 A cement-block walled and wooden floored two-story ’house’ with a ‘forecourt’ and ‘back-yard’, excising a two-bay section of the Shed. 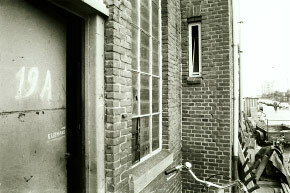 Begun in ‘85 or ‘86 by Wieke van der Hayden who built its walls; then had to leave and sold them to Eelco in ‘87 “at cost”. 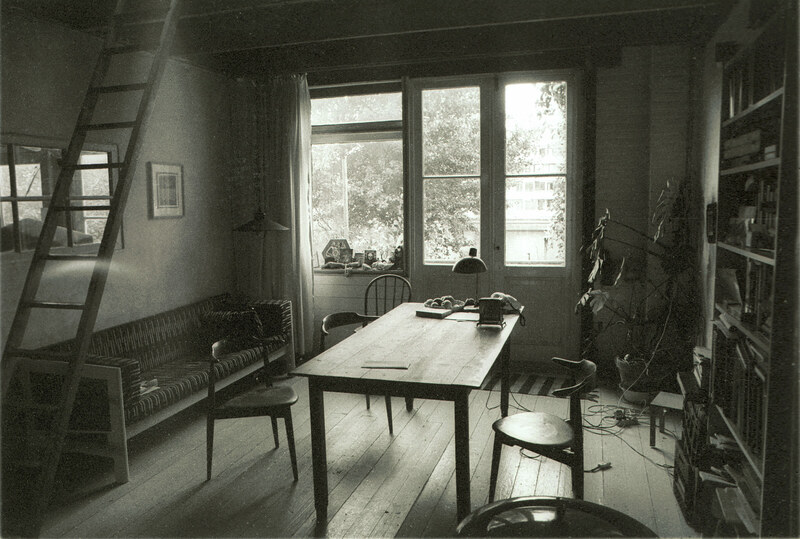 He completed the wooden interior (with family carpenter help) in three summer months. 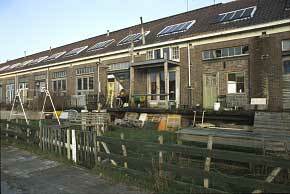 The other De Loods homes (like row-housing) share their demarcating walls. 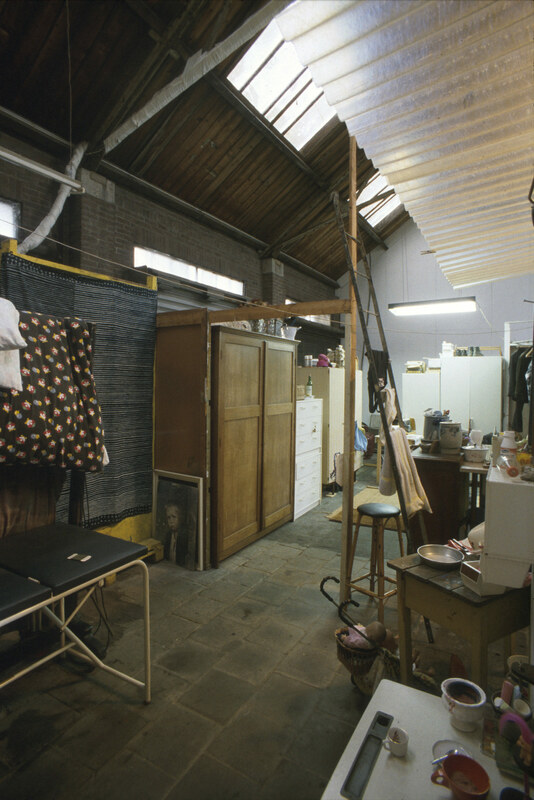 Unlike them Eelco’s is flanked by open workshop spaces and presents its 'exterior' walls to the interior of the Shed as facades - thus its bizarre characteristic: seen from the Shed’s exterior it is like the other De Loods homes co-existent with it, from the interior however it resembles a ‘house’ standing on a plot of land. 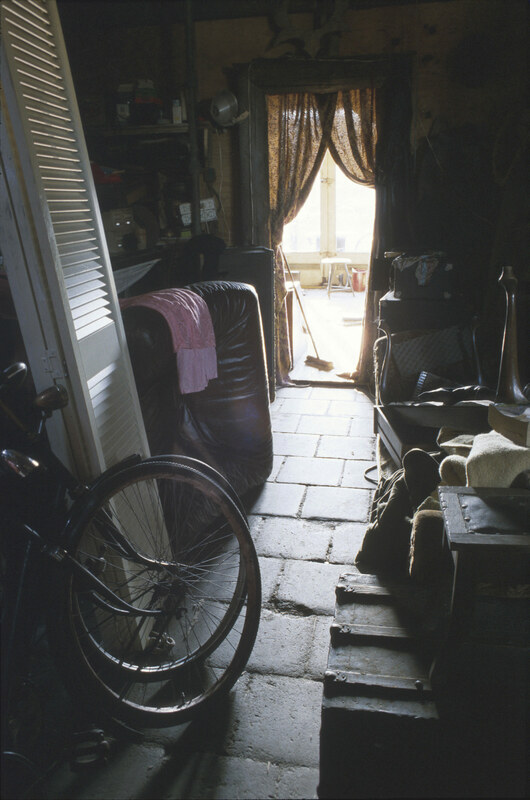 Approached across its 8m ‘forecourt’ of grimy flagstones littered with ‘garden-features’ of rusty machines, its facade fills the shed’s pitched-roof-section with a stereotypical ‘house-shape’, even emitting a ‘welcome-glow’ through the windows of its scavenged ‘cottage-style' door - while at its ‘rear’ a ‘back-door’ opens into a walled ‘back-yard’, overlooked by living- and wash-rooms through domestic ‘cottage-style’ windows. 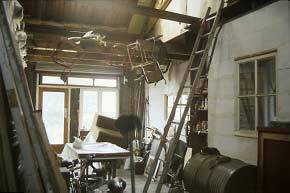 Facing these facades one forgets that this familiar house-form is enclosed under, and is using as its own, the shed's great roof ! 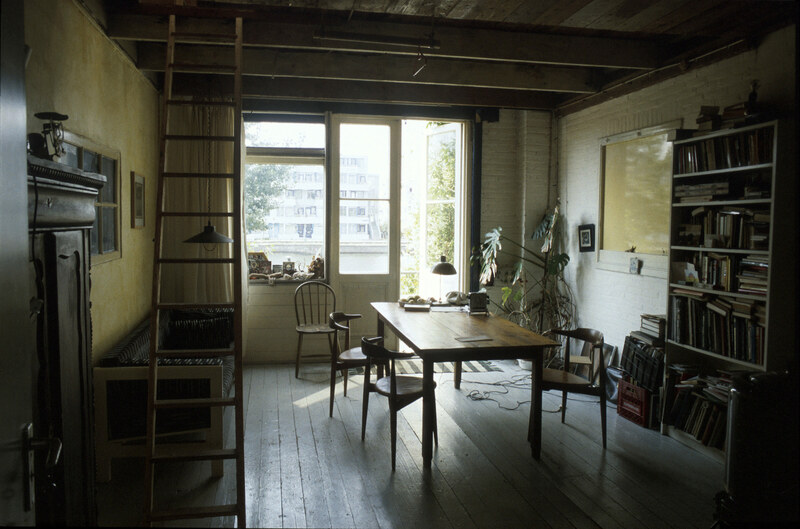 The house itself though stylish and well made is a conventional example of an Amsterdam improvised home - experienced in relation to its location however it is evocative of dreams! 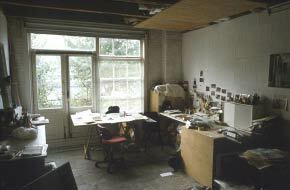 The form is that of a journey moving inwards towards its goal through sucessive spatial enclosures. 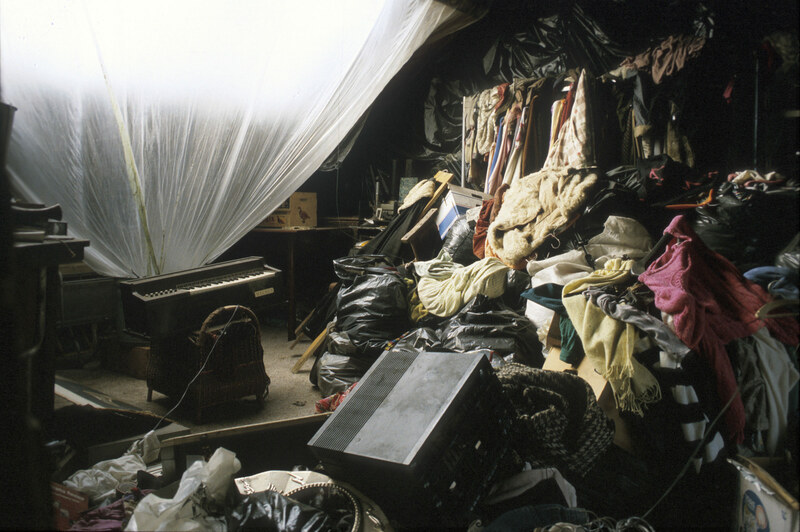 The public roads, the huge squatted shed, the multifarious necessities of the domestic centre nest inside each other in a sequence of containing spaces diminishing in size as they increase in complexity. 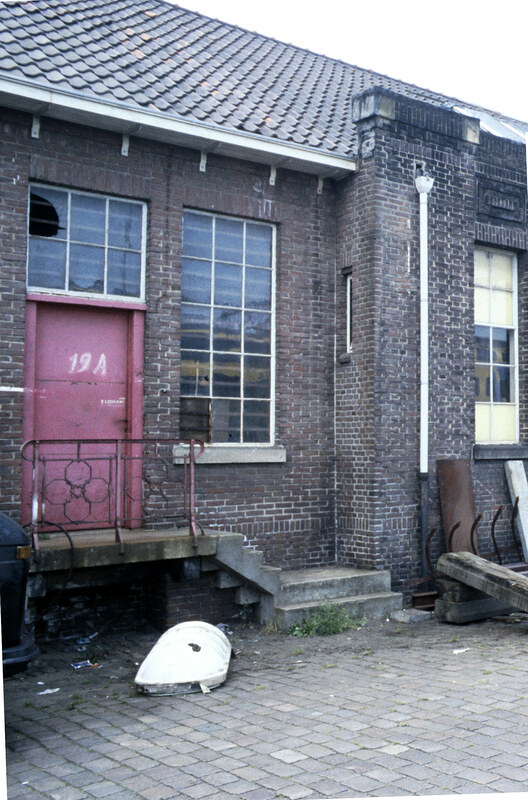 First the space of the limitless sky and wide water of Het Ij, riding west from Centraal Station along De Ruijterkade, narrowing into the vanishing perspective of Westerdoksdijk, a straight trough of dirty cobbles between embanked trains and the great length of the squatted brick shed. 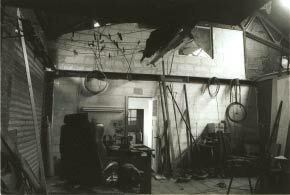 Then through a steel door into the second space, the voluminous and simple interior of the squatted building, the high grey volume of a rust and machine littered workshop, its length blocked by the new wall of a house built entirely within it, emitting a "welcome-glow" through the little windows of its 'cottage door'. 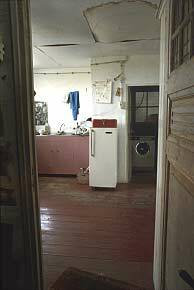 Entering this third space resembles a dream-threshold, so extreme is the dislocation in the context of expectation, the sudden knowledge one has reached a centre - the familiarity of home. Completely within the harshness of street alley shed: the comfort and security, the relaxation and beauty of an entire little house opening through wide glazing onto idyllic water-fringing terraces. A transformation so unforseen that (for me at least) it evokes fairy-tales. 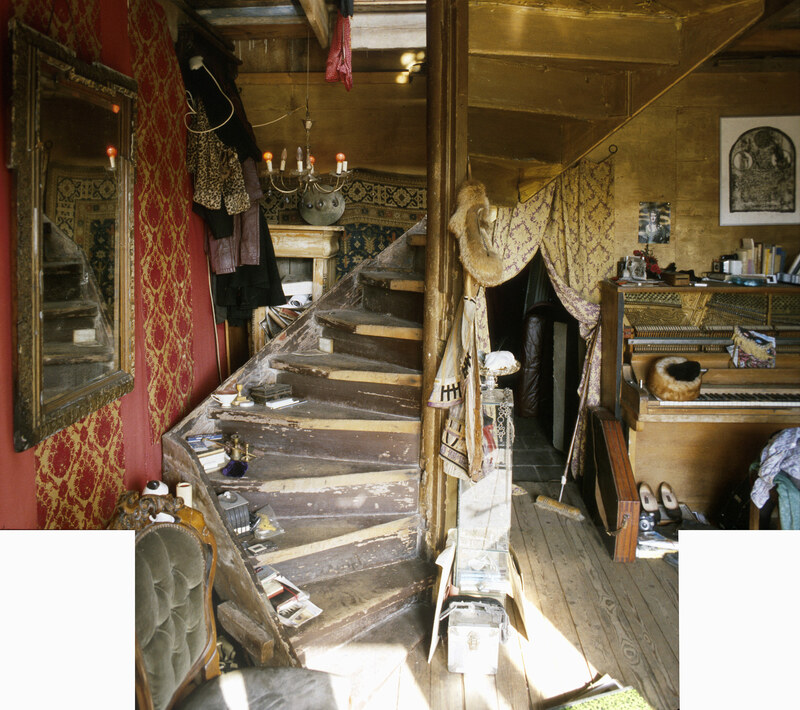 A paradigm of a symbolic journey to a hidden temenos, passing thresholds of significence towards a precious centre of renewal and safety (- it resembles an illustration to a text of Analytical Psychology!). 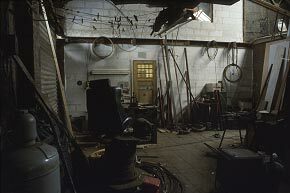 Near the centre of the long Shed, to the left of Annaloos' and Rene's Customs-House, the pink steel '19A' door leads, via a lobby, into Leen's workshop, which doubles as the 'forecourt' of Eelco's house in bays 30/29. Ludicrously, in relation to the architectural conceit of the Custom-House facade style, its flanking pilaster/buttress contains a wc lit by a tiny slit window. 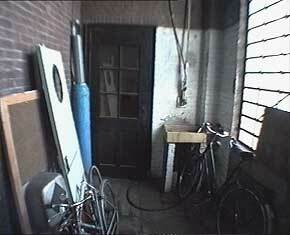 The 19A road-entry is off-pic-rt; the door facing us is the wc. 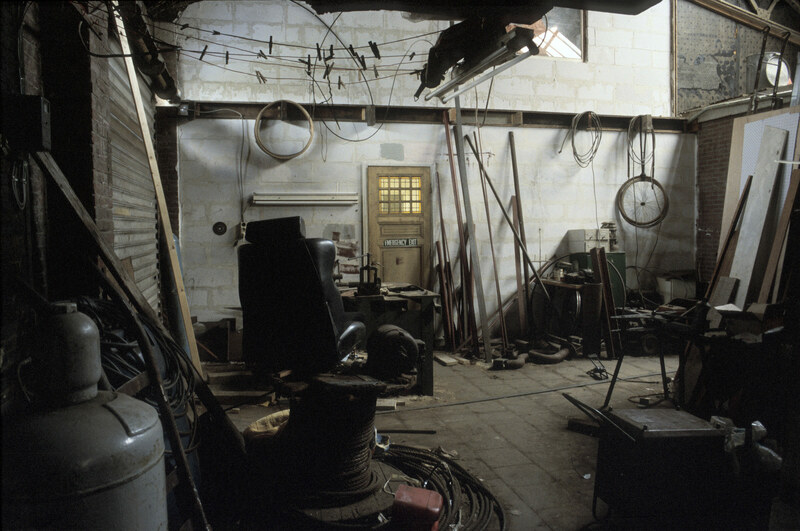 Our back is to the workshop ('forecourt') entry. 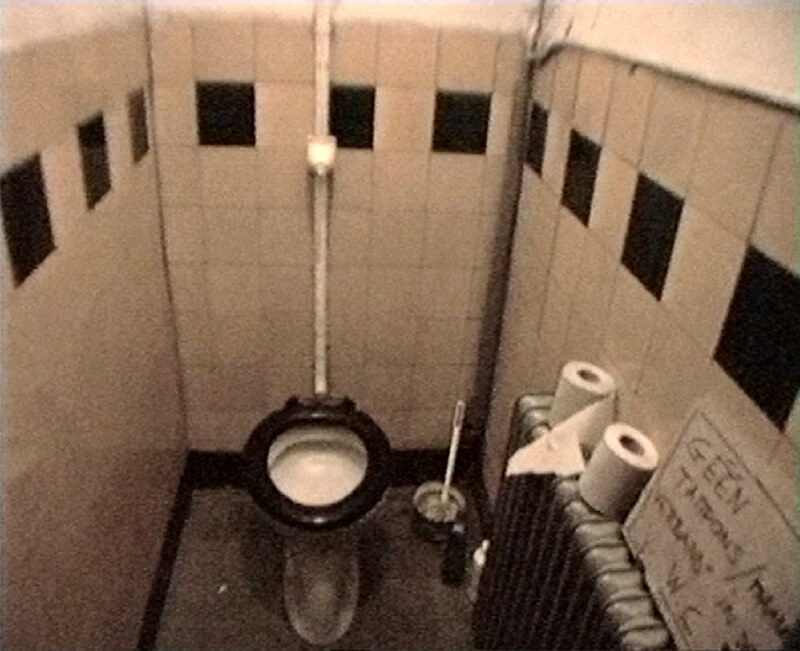 In the flanking pilaster of the Custom-House facade and accessed from the 19A lobby, there is a small wc which Eelco shares with Leen. Looking into the kitchen from the workshop through the open 'front-door' . 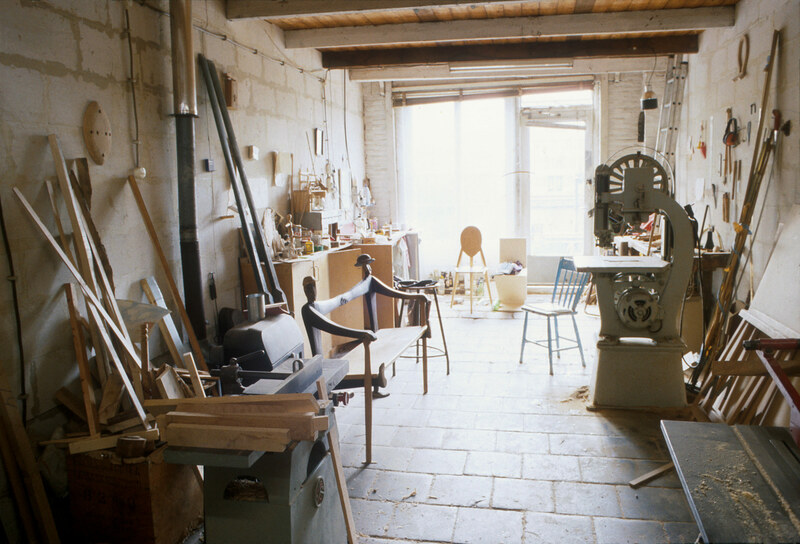 Looking back through the home's open 'front-door' into Leen's workshop and beyond into the street-entry lobby. 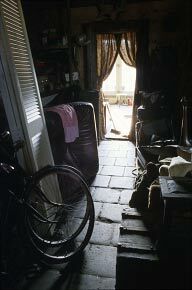 Through the home’s front-door one enters its kitchen, sealed from the gloomy road but for a high strip of windows. 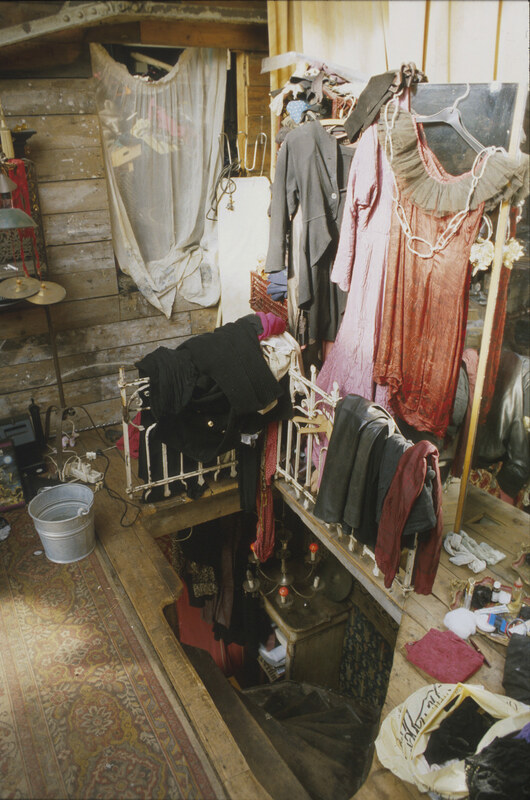 There one can choose the shower/wash-machine room and thence to the ‘back-yard’; or turn into the beautiful wooden living-room facing the green quay and Westerdok water and a ladder to a bedroom. 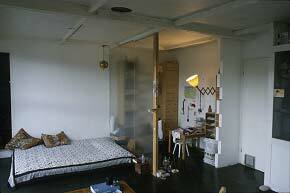 The living-room door is open and the dividing wall's large window rendered translucent with a (?)sheet. 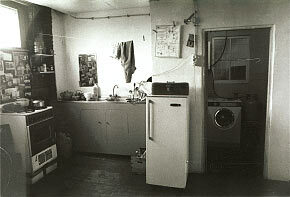 The exit to the 'outside' space of the 'back-yard' is in the shower/wc/washer-room and through a 'back-door'. 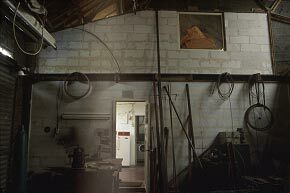 The window looks out into the 'yard'. 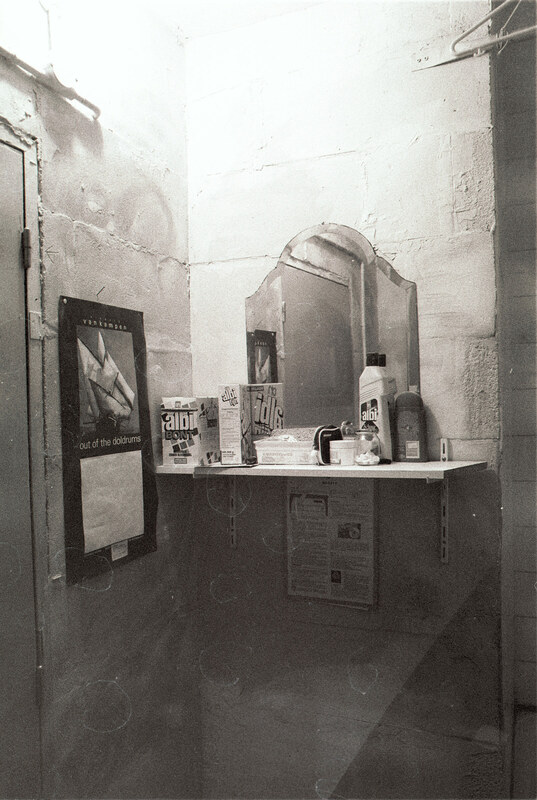 Wash-room mirror corner - the shower is to the right; the exit-door into the (interior) 'back-yard' is behind us. 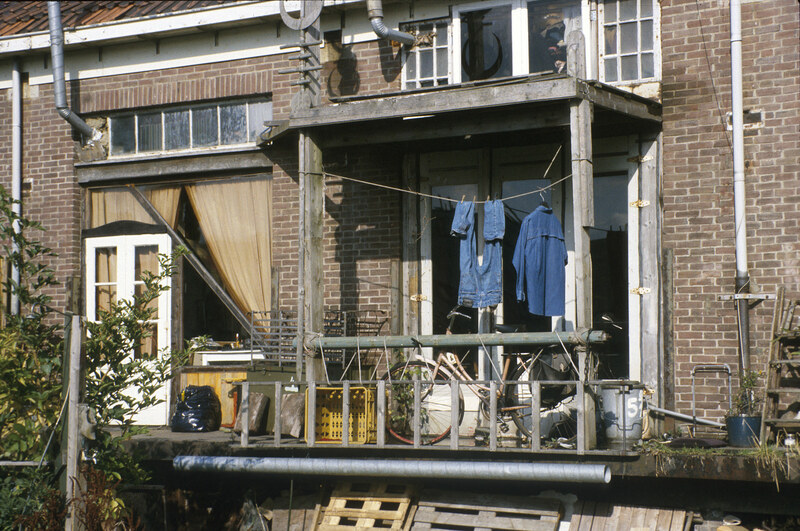 Seen from Eelco's garden - the open door (bay 29) is into his living room [see next pic]; on its right (bay 30) is his 'back yard', a walled store and work space. 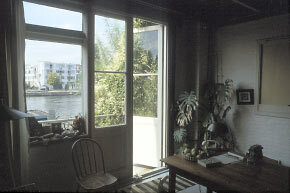 The window affords a view into the 'back-yard' of the house. The bedroom in the triangle of the Shed’s roof, lit by its big skylight and, along its junction with the floor a narrow strip-window (filled with a view of Westerdok waves). At the 'rear' of the house (bay-29) is a walled 'back-yard' store and workshop area, as yet hardly differentiated from the shed. After the two-level 'house' with its ceilinged lower rooms, this enclosed area beyond its south wall - open to the shed's dark roof - is inevitably interpreted as 'outside'. 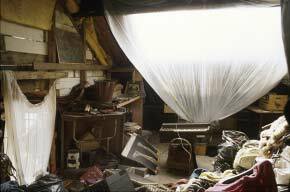 The 'normality' of the rear wall of the house, with its curtained 'cottage' style (scrap) windows and its 'back-yard', is eerily at odds with its encasement in a huge shed.